XANT turbines are conceived for operation in small grids. Whether called micro-grids, island grids or even off-grid, the smaller the grid the bigger the challenge to balance consumption and generation of electricity! This is conflicting with the increasing use of renewables to power these grids. XANT turbines address this challenge without the need for adding complexity to the system or the turbine. XANT turbines are designed according to the JEEP-principle: we kept Just Enough Essential Parts to ensure maximum availability by eliminating failure-prone components such as the gearbox and pitch systems. But XANT turbines are deployed in challenging environments: on hard-to-reach places where no heavy-lifting equipment is available, in harsh weather conditions with extreme wind speeds and very often connected to weak grids with feed-in constraints. All the power delivered by XANT turbines passes through a back-to-back AC-DC-AC converter conveniently located at (or in) the tower base. This not only enables above-standard power quality but more importantly, full controllability of the output power. XANT turbines can be curtailed down to 50% of rated power thanks an advanced power-control algorithm. All this without the need for pitch systems in the hub or dump-loads in the balance-of-plant system. 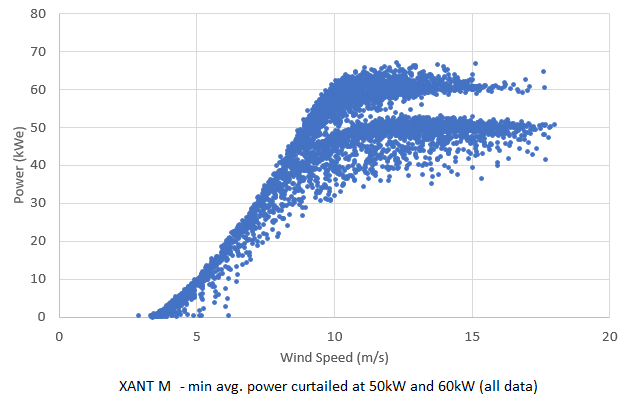 The figure above shows the power curve of the XANT M installed in Horgabost on the Isle of Harris when curtailed at 50kW and 60kW. Due to the limited power evacuation possibility of the local grid, the turbine must run in power-reduction mode at times. This power reduction mode can be activated remotely and automatically using the interface to the XANT wind turbines SCADA system (XANTPORTAL). This enables to coordinate the behaviour of the XANT turbines with an Energy Management System or the local micro-grid controller. The figure shows the raw data of 1-min averaged power outputs. In case active power is needed on a shorter time-basis (e.g. as real primary-reserve), XANT turbines can be equipped with optional energy-storage units to provide controllability of the output power on a 1 second timebase. In the case of the installation at the West Harris Trust community centre, the grid can only absorb 50kW of power: local electricity consumption and the XANT M power output need to be balanced in order to avoid a grid disconnect. Ecodyn, an engineering consultancy based in Scotland; provided the Energy Management System, to maximize the wind turbine output while ensuring grid constraints are respected. XANT is a manufacturer of midsize (50…500kW) turbines for the growing microgrid and off-grid markets. XANT turbines have Just Enough Essential Parts (JEEP! ), fit in 40ft containers and can be erected without a crane. Their extreme simplicity, easy maintenance, silent operation and low cost of ownership make them ideally suited for wind power on remote locations close to the consumer. Ecodyn is a multi-disciplinary consultancy with offices across Scotland and clients across the UK and Europe. For over fifteen years, Ecodyn has developed a reputation for excellence and integrity across a wide range of environmental disciplines. We are a highly experienced small/mid-scale wind turbine installer and certified by the Building Research Establishment to assess EcoHomes projects.